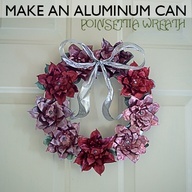 Poinsettia Check – Aluminum Can Craft? On the seventh of each month last year, Jeremy would do a poinsettia check. He had planned to save his from Christmas 2011 and, with love and tenderness, revive them to bloom the following Christmas. He abandoned his project September 8, when it was clear there was no chance to save them. I was visiting Roger’s mother earlier this month, and her poinsettia (with little personal attention) appears to be thriving. 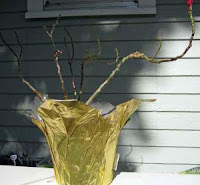 That made me think of writing a post combining recyclables + poinsettias = something fabulous for next year. I went to the website where I got the great idea to make recycled soda can angels, and Johnnie, the crafter behind the website, “Saved By Love Creations” has already blazed the poinsettia soda can trail. In addition, she mounted her tin poinsettias on a stove ring, making it completely recycled. Johnnie’s website gives step by step instructions for the poinsettia wreath, with additional pictures of the Martha Stewart fall leaf wreath made from soda cans. I can do this! 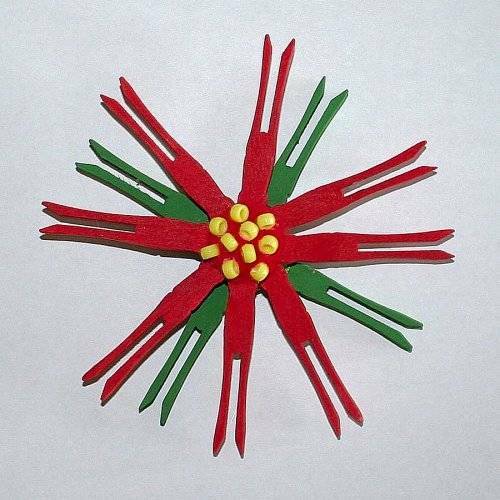 I found another, less inspiring clothespin poinsettia, which I can make easily because I have plenty of those clothespins in my laundry, but I would have to do some re-configuring because they are a little too big to make a proper ornament. Still, this clothespin version would be successful when crafting with a child. 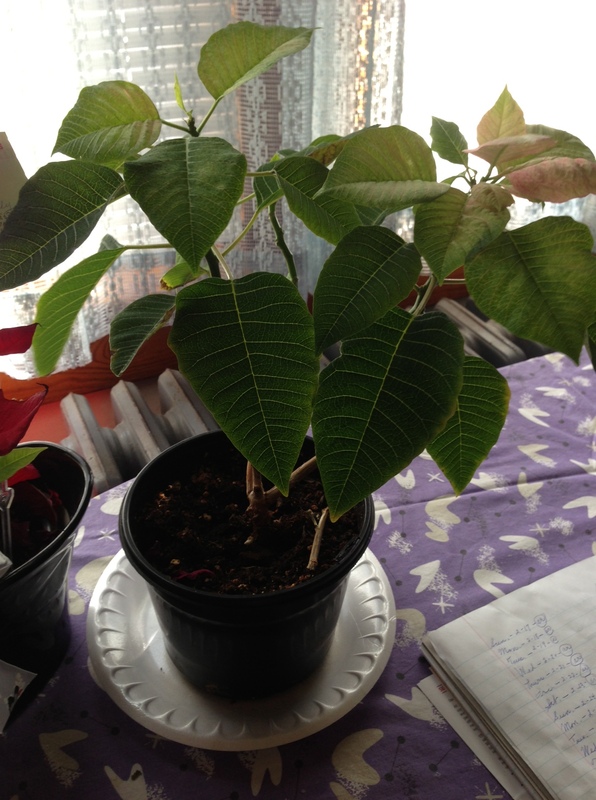 It’s the 7th and that means it’s time to check in on the progress of my 2011 poinsettias. It’s August and the guidelines for care tell me that my stems should have new growth and lots of leaves. I need to cut back the new growth to 3-4 leaves. Once trimmed it is time to bring the pots back inside and place them in a sunny window. The growth will continue with good watering and fertilizing through September. Here’s the trouble, my plants are not growing anything new and there are no leaves to cut back. I’m not sure where I went wrong. Maybe it was too dry? Maybe it was too much water before moving outside? Both concerned me. I’m going to give it until the end of September before pulling the plug. I hope your plants are doing much better and looking flush and green. Here’s the good news, come Black Friday I’ll have my choice of 99 cent plants from both Lowe’s and Home Depot I predict. Then the plan will be to immediately repot those babies so I can see them through to 2013! Time to check in on the poinsettia plants. Those 2011 plants are coming along. We are six months into this experiment. I have to admit that in May I was losing hope on these things making it to Christmas 2o12. In May it was time to cut the plants back way back and to repot them. After that it was time to water regularly and bring back to the sun. In June the care plan directs you to wait until you start to see new growth and then move the plants outside to warm and sunny locations. After a few weeks you are supposed to cut back each sprout by about an inch. This is to allow the plant to gain some width and not grow tall and spindly. My challenge has been the move to outside. We have had an oddly cool start to June and I have not moved the plants to the porch yet. This next week is supposed to be a return to seasonal temps in the 80s. Hopefully my 5 pots will make the move to their summer location soon. I am really excited to see where they go from this point. Let’s all hope for full and beautiful plants this winter. 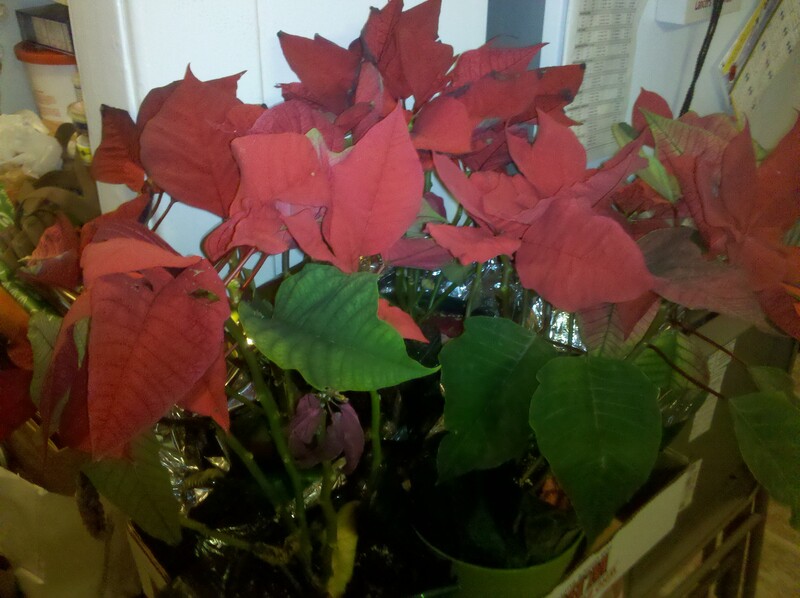 Well it’s the 7th and that means it’s time to check in on my 2011 Christmas poinsettias. Remember- these are the plants that I bought in December and am now trying to keep for next December. I have been following the guidelines I found on-line. Simple enough. In February I learned the importance of NOT keeping the plants too close to the glass in the sunny location they should be placed in from January-March. My plants took a little damage. March is our last month to continue with the same process. Order of business for this month is more light, more water, and continue with the humidity. This last month I seem to be plucking more and more dead leaves off the plants. They aren’t looking all that great but they are continuing to sprout new leaves and grow. Looking a little spindly but living! I’m looking forward to April when I get to start drying them out and moving them to colder, darker locations in my house. This week has brought unseasonably warm weather to us here in Maryland. Since it’s supposed to be 70 tomorrow I have started to wonder about planting actual poinsettia plants in a garden. Would that be possible? Turns out it is not recommended for our region in the US but there are LOTS of guidelines out there if you live in the right area. 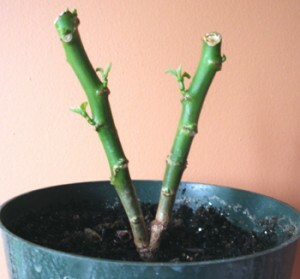 Check out the guide from GardenHelper.com if you want to plant your own- Poinsettias in the Garden.